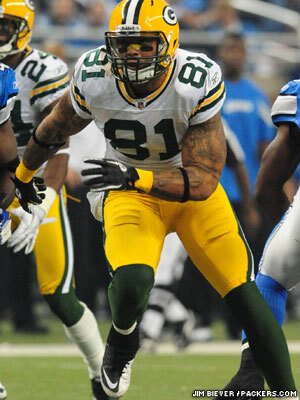 Packers TE Andrew Quarless is excited about the progress of his recovery from reconstructive knee surgery, and he’s pushing to be on the active roster for Week 1 of the regular season. That timeline would be awfully aggressive and might be wishful thinking on his part. Speaking with reporters on Saturday, Quarless said he’s not quite seven months removed from his surgery, which became necessary when his 2011 season ended in Week 13 with a knee injury on kickoff coverage. He has been on the physically unable to perform list throughout training camp and hasn’t practiced. It’s still entirely possible, if not likely, that Quarless will remain on PUP at the start of the regular season, which would keep him off the practice field and out of games for at least the first six weeks. But the third-year tight end isn’t thinking in those terms, at least not right now. He said he began cutting on his knee a few weeks ago, and he likens his rehab regimen now to “training for the combine,” with running cone drills and dragging weighted sleds. He’s aiming to feel “90 percent” as soon as possible, knowing it will be closer to a full year after his surgery before he’s truly 100 percent. “Right now we’re shooting for Game 1, and when Week 1 comes, we’re going to see the status of my knee,” he said, calling it a week-by-week thing. If Quarless remains on PUP throughout training camp, the decision on his roster status will come when final cuts are made Friday, Aug. 31. At that point, the Packers would have to decide whether to include him on the 53-man active roster, or keep him on PUP for at least the first six weeks of the regular season. On an unrelated note, Quarless also discussed his feelings of the fallout from the scandal at Penn State, his alma mater. He admitted to having mixed emotions, because he credited Penn State head coach Joe Paterno for giving him a second chance at football after some off-the-field incidents early in his college career, yet the investigation into the scandal revealed that Paterno was among the individuals at the university who knew of the sexual abuse allegations involving then-defensive coordinator Jerry Sandusky more than a decade earlier. Having given the situation a lot of thought, Quarless said the reverence with which Paterno was viewed at Penn State contributed to what unfolded. More than once, he used the phrase, “There’s only one God.” Yet, he didn’t want to speak ill of the deceased Paterno, particularly because he played such an integral role in Quarless straightening out his life and making it to the NFL. “You should never put people … above who they really are. That’s one of the things I took out of it,” he said. “He’s one of the reasons I went there to play, and my feelings haven’t changed, but it’s a tough situation. I feel like he could have done more … there’s more that could have been done as a whole, from the athletic director, the president. Definitely a lot. Quarless actually chuckled at the notion that all of his collegiate victories have been wiped from the record books, per the NCAA’s punishment of the school, but he’s not going to let that bother him. Everything about the scandal is — or should have been — bigger than football.